Today my office filed an amicus curiae (friend of the court) brief in the Eighth Circuit Court of Appeals on behalf of the Center for Constitutional Rights and Palestine Legal in support of the challengers to Arkansas’s unconstitutional anti-boycott law. The law requires contractors who want to do business with the state to pledge not to boycott Israel. As the brief explains, the Arkansas law is part of a broad effort to punish advocacy of Palestinian rights and those who seek boycotts, divestment, and sanctions against the Israeli government, in violation of the First Amendment. Palestine Legal protects the civil and constitutional rights of people in the U.S. who speak out for Palestinian freedom. Learn more at palestinelegal.org. The Law Office of Matthew Strugar is a First Amendment and protesters’ rights law firm based in Los Angeles, California. Learn more at matthewstrugar.com/. We defeated another Ag-Gag law! Today the federal court for the Southern District of Iowa granted summary judgment to our clients in our challenge to the Iowa Ag-Gag law and struck down the law as unconstitutional under the First Amendment. Ag-Gag laws seek to criminalize undercover investigations at factory farms and other animal agricultural facilities by making it illegal to take videos or photographs inside such facilities or failing to disclose one’s affiliation with an animal rights organization when applying for a job. With this ruling, animal right advocates should be free once again to inform the public of the horrific cruelty of factory farming. This victory comes on the heels of our victories against Ag-Gag laws in Utah and Idaho, and we have pending challenges against Ag-Gag laws in Kansas and North Carolina. The plaintiffs in the lawsuit are the Animal Legal Defense Fund, Iowa Citizens for Community Improvement, Bailing Out Benji, People for the Ethical Treatment of Animals (PETA) and the Center for Food Safety. In addition to my office, they are represented by the Animal Legal Defense Fund, the American Civil Liberties Union (ACLU) of Iowa, and Public Justice. Today, my office, along with the Animal Legal Defense Fund, the Center for Food Safety, Public Justice, and Kansas advocacy groups Shy 38 and Hope Sanctuary, filed a lawsuit challenging Kansas’s Ag-Gag law. Like Ag-Gag laws in other states, the Kansas law criminalizes undercover investigations at factory farms and slaughterhouses, silencing animal rights activists and ensuring animal cruelty, unsafe food safety practices, environmental hazards, and inhumane working conditions go unreported. The lawsuit contends that Kansas’s Ag Gag law violates the First and Fourteenth Amendments. My office, along with other members of the coalition, have already been successful in striking down Ag-Gag laws in Idaho and Utah as unconstitutional, and we are litigating challenges to similar laws in Iowa and North Carolina. Today my office filed a lawsuit on behalf of the ACLU of Southern California seeing seeks records concerning Immigration and Customs Enforcement agents’ practice of posing as local police departments investigating non-immigration related crimes, wearing misleading uniforms, and engaging in other deceptive conduct to conceal their identity. Through these ruses, ICE agents have attempted to gain an individual’s consent to enter their home or other private property without a warrant. This practice has been widely reported in the media. The ACLU of Southern California submitted a Freedom of Information Act Request seeking information related to ICE agents’ practice of misrepresenting or concealing their identity when conducting enforcement actions. But after more than eight months, they still haven’t received any responsive documents. We are suing to force ICE to force it to provide these records. Read the complaint here. Another day, another transit company trying to silence a White Coat Waste advertisement. 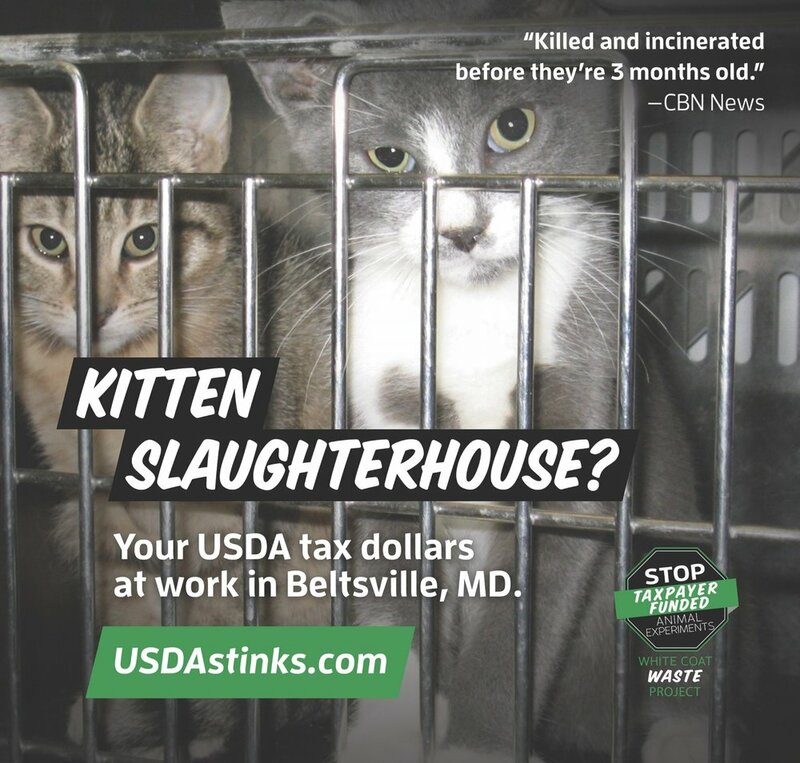 Today my office filed suit against the Maryland Department of Transportation and related entities for refusing to run White Coat Waste’s advertisement criticizing the Beltsville USDA lab’s practice of killing six-month-old kittens in medical experiments. Using documents obtained through the Freedom of Information Act, White Coat Waste showed that the USDA laboratory breeds up to 100 kittens a year, feeds them Toxoplasma-infected raw meat, harvests their feces, and then kills and incinerates the kittens. Because the transit company is a government entity, it must follow the First Amendment. By discriminating against advertisers like White Coat Waste based on their identity or message and allowing one side of a debate to get its message out while silencing the other side, the transit company is violating the First Amendment. For this, the two young women were hit with a lawsuit alleging that they defamed the woman in the Mercedes and seeking one million dollars in damages. My office represented the two women. We filed an anti-SLAPP motion—a motion that asks the court to dismiss a lawsuit that is brought to retaliate against people who are expressing their First Amendment rights. We argued that the women were expressing their free speech rights on an issue of public interest and were well within their rights to say what they said. Today the court dismissed the lawsuit and ordered that the plaintiff pay the young women’s attorney’s fees. Read the order here. If you find yourself sued for exercising your free speech rights, contact my office. Last May, eight asylum seekers began a peaceful hunger strike to call attention to the inhumane conditions at Adelanto Detention Center. In return, they were violently assaulted, pepper sprayed, and thrown in segregation, where they were denied access to their families, advocates and lawyers. Those young men have now filed a civil rights lawsuit against ICE, GEO Group, and the City of Adelanto. Join us at this very important press event to support the men, to uplift their voices, and to make clear to ICE and this Administration that the incarceration of migrants -- and the inhumane separation of parents and children -- has to end. If your organization would like to endorse this event and be named on the press materials, please let us know.